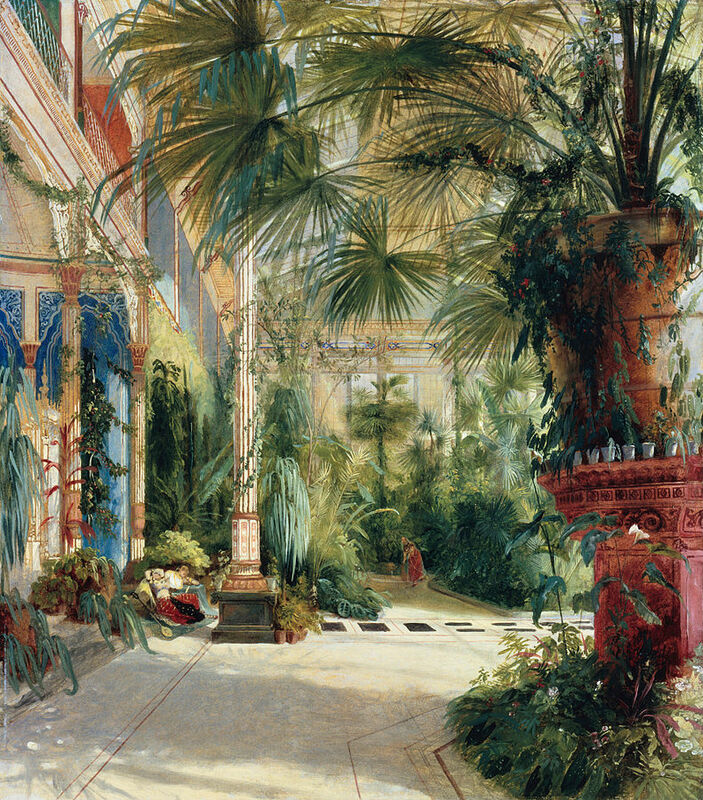 So we were talking the other day about what to (finally) do about the dining room and Mike said it would be wonderful if we could make it feel like the Blechen painting of the palm house in Potsdam… And after a little searching it turns out we’re not the first people to have that idea. 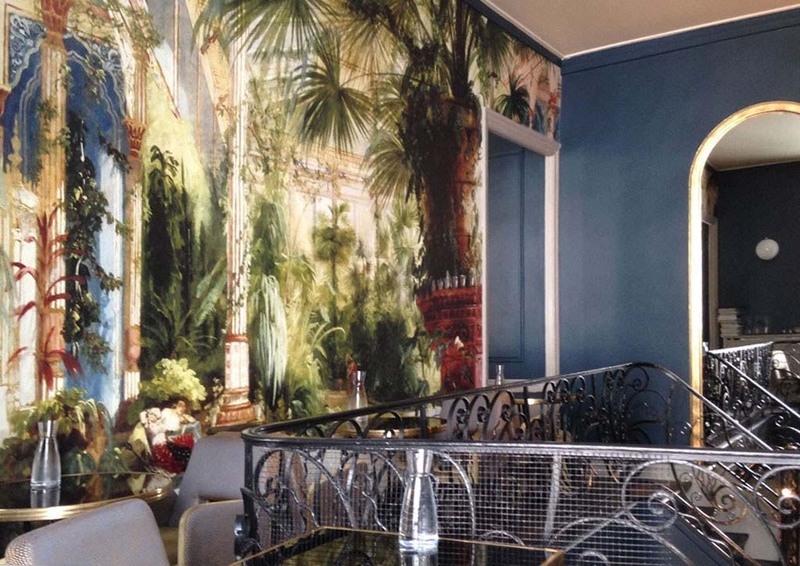 There’s a restaurant in Paris which has done it. Quite successfully in my opinion. So we’ve ordered from the same company that did their wall. They’ve promised delivery in less than 10 days. Exciting. It’s going on the same wall as the doors. Loved the word play in the title … brilliant! Can’t wait to see the end result. It is a lovely room in waiting. 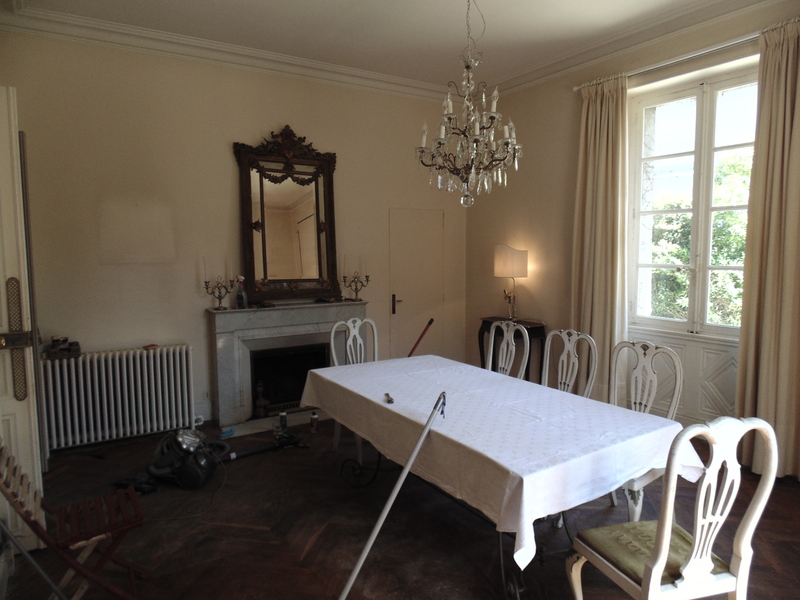 It’s south facing and very pleasant – but oddly the only of the entertaining rooms where the walls are completely bare. And there seems to be no record or memory of how it was originally decorated. I like the conservatory-in-oil-paint feel of it. Painted trees must be easier to take care of, right? They require less watering. Carl Blechen was quite something. A master at capturing very distinctive moods. That looks super…and the room is big enough not to be thrown out of balance by it. I do hope you’ll show us the result when it is in place. 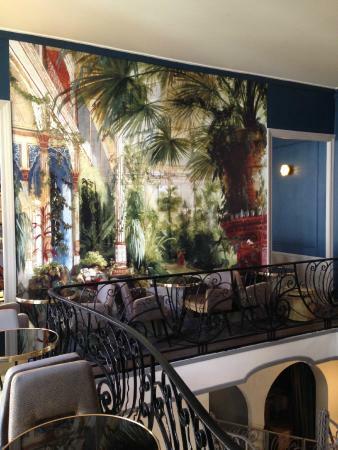 In the last house in France the other public rooms had had ‘scenic’ wallpaper…scenes of cliffs, tempests and shipwrecks for the most part…but the dining room was bare. Then we discovered that it had been dry lined and underneath were murals of Italian lakes and mountains. We were lucky in that whatever the culture vulture body of Poitiers was called – no longer remember their title – sent staff to look at them and help us preserve what we could. Not just, I imagine, for their intrinsic interest but because the previous owner of the house had been a fairly well known philosopher in her time. Needless to say the new owners have covered up the lot…I loathe the people who have bought our houses, almost without exception. Adding the large plants will transform it. A daring scheme. Go big or go home. That’s what we say in ‘Merica. Love the audaciousness. The mural is over 8 feet tall, so we’re definitely going big! I know what your living room looks like! And I like it, btw. I spy on people. Yeah! Another re-decorating project, I love following along. 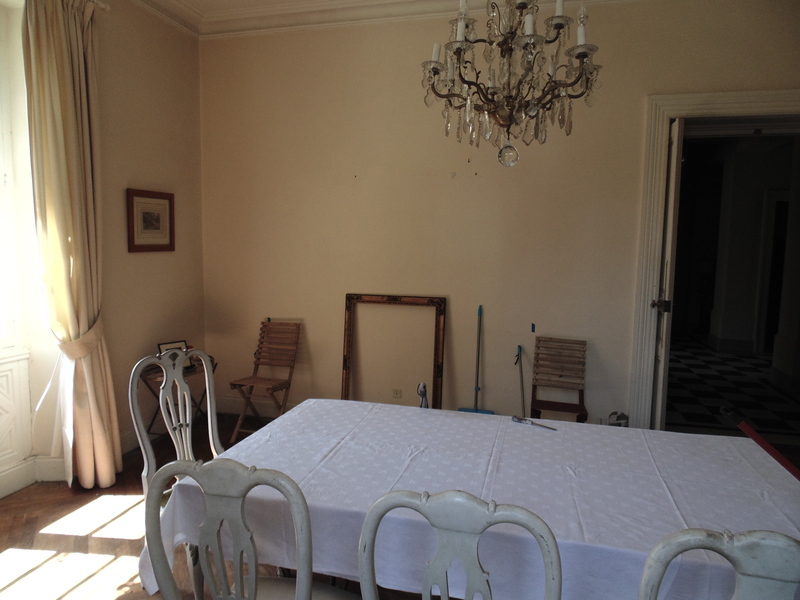 Before we start, is that your actual dining room table and chairs? Sometimes I like things avant-garde but actually can border on tacky, ha-ha-ha, it’s true though, I have to be careful. Love the idea the concept shown in the painting. This is a whole room re-do, right ,painting the walls and ceiling? Although I love decorating with plants I am terribly irresponsible and don’t water them. I get like this rush of enthusiasm, go to the plant store buy a bunch of plants and pots, am good for a while but then eventually I lose interest and they all die. I have wasted so much money over the years on plants that are destined to die, that I simply stopped buying them, so anybody who is going to decorate with plants I am enthusiastic as I know I could never do it. You know how sometimes you see something, a news article or something and think, “That’s interesting,” so you go and research it. So lately I have been researching hydroponics. I might try plants again but hydroponic plants, that way I rarely have to water them. There is a method in hydroponics, google “Kratky Method” and there are a bunch of youtube videos on the Kratky Method that really show how it is done. If I would do it, I know I would use rock wool as the growing medium, as the starter medium. So I was thinking how about like window box planters, or planters you hang off the balcony, you know what kind of planter i mean, the long ones, how about those window box planters using the Kratky method and grow “tall decorative grass,” you can google that. The thing about potted plants is they do take up space and if you have the space then that’s great, but if space is an issue then I was thinking tall decorative grass would be cool as they grow up not out, giving the living plant ambience without taking up the horizontal space in the room. Please keep up up to date on what you are considering and what you ultimately decide on, I love your decorating projects. I love your bold decorating ideas. As I cannot make up my mind between pale cream walls or something more adventurous (pale will probably win, again), let alone choose new curtains, your rooms are a delight. Your dining room will look wonderful. Don’t forget to post plenty of photos. The thing is I don’t mind getting it wrong. In fact I get it wrong very often, but then the adaptation and refinement ends up with results much more sophisticated than if I started out with a safer idea. So did you kill the other wallpaper then, The one with the lobsters and crabs on them? We tried to create a plan around it, but it didn’t work out. The ceilings are so high it would’ve of disappeared in the room. The mural (which gets delivered today!!!) takes up most of the wall panel to the left of the doors. So it’ll be a much more dramatic effect. I think you are right, your walls are to tall for the bottom boarder paper. Especially you can see this when you look at the pic that shows the door. Were you thinking of painting the chairs at all? I know on antiques most of the time you are not supposed to paint them, but they look kind of blah (I hope you don’t hate me for saying that). Blah as in the current color, they look like they are a light gray, the chairs themselves look really nice. Gray is HUGE as a color today, I bet it is the most popular neutral color being used today, everybody loves it but me apparently. I once did a very large blind in gray and I hated it, the color just left me so cold, but I paid so much money for that custom blind I left it and simply regretted, it was a live and learn experience, it was in the dining room actually. Even the warmer graphite color, I just can’t get into it either. Like I said most popular color being used today, so I wouldn’t be surprised if you kept the chairs their current gray color. I was just wondering if you were thinking of painting them. We have a complete kitchen remodel happening in a few moths and I’m really struggling with a base kitchen color. I know I am going to stencil the walls, and of course I am struggling with that also. What do you think of these two? 3 of the walls go up probably 15/18ft. It is contemporary with a giant window over the sink probably 8ft long, looking out to a fabulous view. That is the low wall, probably just an 8ft tall wall. The cabinets are a light tan with gold/honey undertones, white quartz counter tops. You would probably hate it, they are contemporary cabinets with no drawer pulls, just that sleek look. It’s a fairly large kitchen with an island in the middle seating for 6. There will be a little bar area with a wine cooler and a cabinet for liquor and bar glasses. Because of the design one wall won’t have anything on it at all, it goes wall, then a 3ft wide path then the kitchen Island, so that wall in particular I really gotta do something with, and something more than just paint it a monotone color. I’m not wallpapering up 18ft so stenciling is what I decided. These walls are so tall that the tallest step ladder I bought and me on the top step I cannot reach the top of the wall at the ceiling. My husband stacks 3 cement blocks on top of each other (4 sets) and then we put this seriously tall step ladder legs onto the tower of cement blocks. I painted this room white (it has a lot of bright green tiles on it now) must be 3 or 4 years ago and what a pain. It should be easier this time because I am going to get all the cabinets ripped out, all the tile taken off, have it re plastered and then I’ll paint. So it should go easier painting in basically an empty room, a lot less edging to do, even still there are 3 doors in the room. 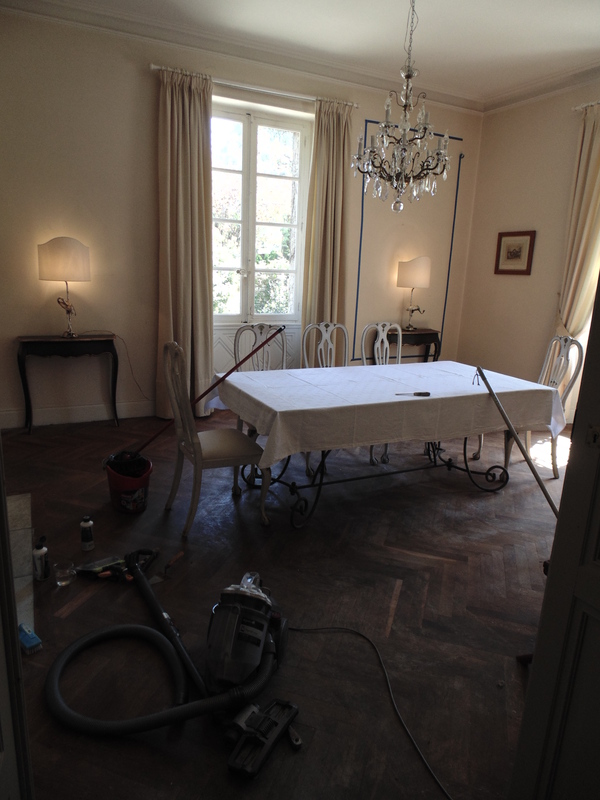 I think my decorating chores are easier because I don’t have a historical stately home like you do. 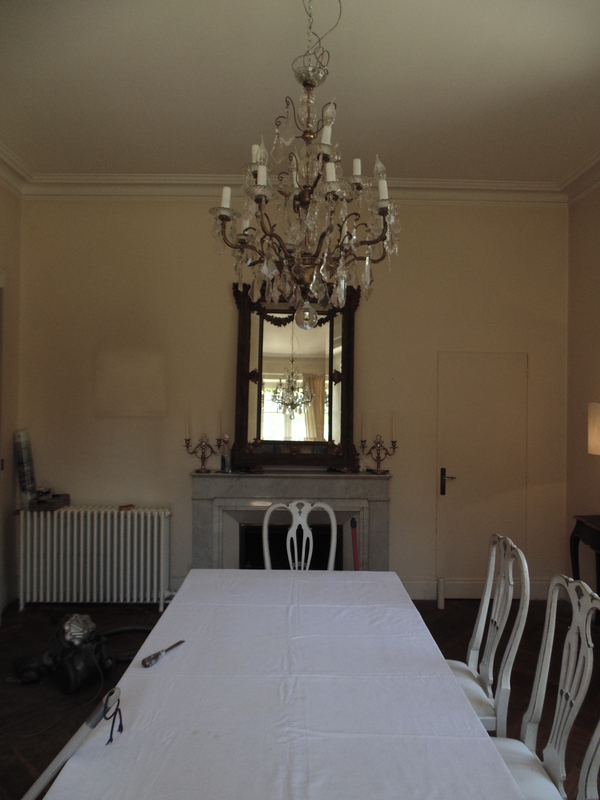 The chairs are white and we’re not sure about colours yet. I did buy them before we left Spain because they’re versatile and easy to adapt/paint. A murial! It’ll look just like Hilda and Stan’s place! OMG, I found the stencil house to die for. Their problem is they do not invest in showing painted room setting utilizing their stencils. You really gotta be able to self visualize what you could do. I love this place. The art nouveau stencil. I love this design and actually I love these colors as well. Do you think I would be crazy to some how figure out a scheme to put these in a kitchen? i like this place because they will re-size them bigger or smaller. Am I crazy, be honest. The chairs themselves, I agree with you, are very nice. It is going to be hard I think to get a good paint, just the right paint to paint those chairs. I don’t think I have ever painted furniture. I have never done it but I don’t think painting furniture to a very high standard is that easy. I forgot I did re-paint my porch furniture, and what a job that was. I used an air gun, and it did come out great but man that lacquer, did it run, it really took me a while to get a technique, I did the bottoms and backsides first to get a technique. But dinning room chairs I would be hesitant to tackle that, not that I wouldn’t do it but I would be afraid.. I think they will look smashing painted in a color that fits in your dining room. I like purple & lavender, #72 in the right colors would be great. the length of the wall is 9ft until I hit a double door, and then add another 7ft for the door and a small wall portion, but that wall keeps going up higher, it’s 11 ft tall by the left side of the double door, but it keeps rising. I can’t measure it as my tape measure won’t extend up that high without falling over, but spit balling it I would say it goes up to around 15 ft. With huge beams, and I hate those beams, I painted the ceiling with those beams a couple years ago, and to stencil up that high where you have to work your stencil around the beams, argh, not fun. I would have to stencil around 4 beams at the ceiling if I went full wall stencil repeating pattern. I am re-thinking a repeating full pattern, giving a wallpaper affect, as that is going to be a real bear on top of the door where it goes up so high, and there is no good way to just draw a line and stop it. In other words, if you are going to do that wall you gotta do the whole thing, no stopping at the door. Even the 11ft at the door is going to be a challenge. The term in stenciling is called a motif, where you have one splashy stencil that does not repeat, I think of it as kind of like a painting. My planning on stenciling up to now has been from my living room sofa, but since I went in to measure and really looked at that wall, I realize what a project this is going to be. It’s hard because there are cabinets on it now, so I don’t get to just look at it as it will be, a big blank wall. Oh do I love this guy, the cockerel. LOVE THIS! If you google cockerel in Google Images you will see many wonderful wonderful colored cockerels. I like an animal in the kitchen, you eat animals, ha-ha-ha. But I don’t want anything cutesy, I really don’t want a quote/unquote traditional kitchen pattern, but I can’t make up my mind about feathers and flowers in a kitchen. It’s such a big wall, and it is the only wall without any cabinets or kitchen appliances on it, so I am sure it is going to stand out. I don’t really like the flowery flowers, more art deco, art nouveau flowers. Can you do that in a kitchen? I’m not sure you can, I am not convinced, but I love so much the designs. This entry was posted on April 30, 2018 by The Pink Agendist in design and tagged design, dining rooms, interiors, wallpaper.